In a medium saucepan, bring water, sugar, and lemon zest and juice to a boil. Pick basil and tarragon leaves and place in a large bowl. Douse with boiling sugar water. Then allow to cool. Place sieve inside of a casserole dish. Pour basil-tarragon syrup through the sieve and remove wilted herbs. Transfer granita to freezer and allow to set for approx. 5 – 6 hours. Set berries aside. Halve grapes. Peel mango and cut into cubes. Transfer all fruit to a large bowl. Juice lemon and add to fruit salad, as well as sifted confectioner’s sugar. Mix well. Pick mint leaves and roughly chop. Add to fruit mixture and mix thoroughly. 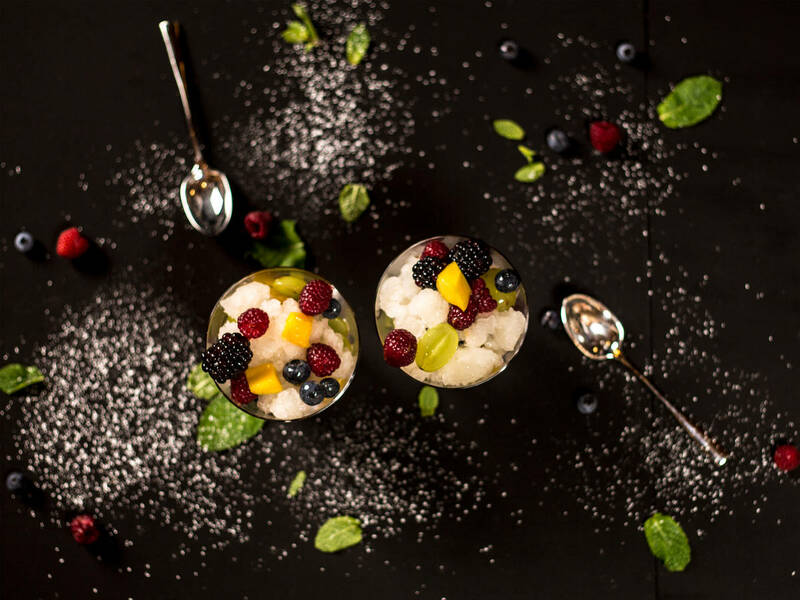 Fill serving glasses with fruit salad and top off with granita! Enjoy with your loved ones!